All Fools' Day brought 6 yachts to the start of the Sailtech Spring Series, the first of four Saturday pursuit races at Flushing Sailing Club. The Race Officer Mike Robson selected a Northwest group and a course leaving Vilt and Governor buoys to starboard with two rounds. The wind was quite brisk and funnelled down the Penryn river as the two Folkboats Aurora and Aries manoeuvred for the start. 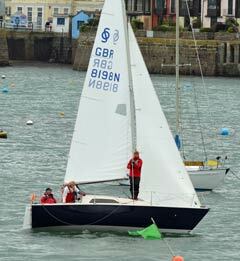 One minute later Trifle set off flying a number two jib and spinnaker pole at the ready when the wind came on the quarter. Two minutes later the two GK24s started with Wilkie a few boat lengths ahead of Kaimana. 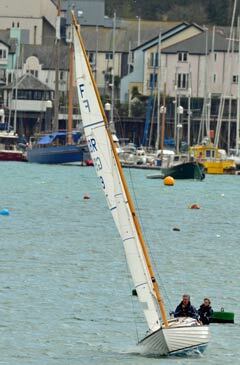 The rear of the fleet was brought up by Minx several minutes later. The object being that we all start on a predetermined handicap time and all finish together. 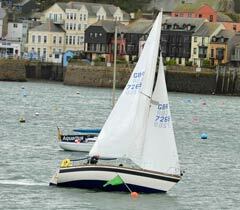 Aurora set of at a cracking pace and wisely dipped southwards of the Trefusis Point where the wind gusts tumbled over the hill and gave challenging spinnaker conditions. On Trifle we went a bit too close to the point, got caught in turbulence and had a series of broaches. Aurora rounded the Vilt and gybed onto a starboard spinnaker run to the Governor. Aries rounded just ahead of Trifle who was chased hard by Wilkie. On Trifle we set off dead downwind and managed the gybe but then managed to get the kite inside the forestay! My right hand forefinger still has the rope burn to prove the ensuing struggle to sort the problem. (Stupid boy Pike! My sailing gloves were in my pocket!) Wilkie powered through. Aurora was a distant memory and Aries had left us for dead. We dropped the kite and rounded the Governor and started to play catchup on the beat. We crossed ahead of Aries further up the river but she managed to squeeze us at the turning mark off the club. Another broach spinnaker run saw our position deteriorate and we slipped down to 5th place as Kiamana took us on the second leg to Governor. Eventually we managed to overtake her on the beat back home. Aurora had a well deserved win with Wilkie second and Aries third. Trifle came 4th and won a bag of laughs from the other crews.